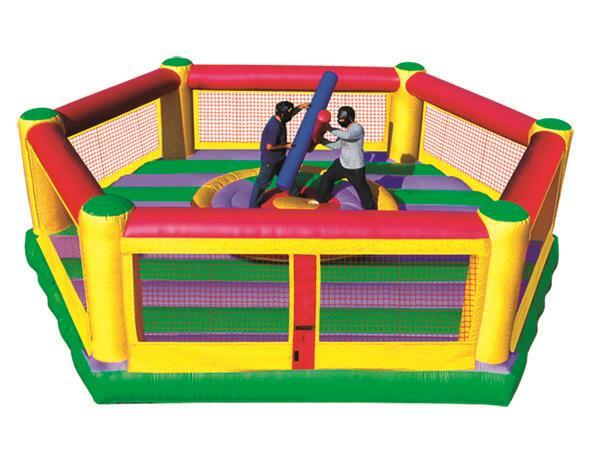 This competitive game pits two gladiators doing battle against each other atop a padded pedestal in an inflatable arena. Who will be the first to be knocked off balance and off the pedestal by a blow from their opponent's foam padded joust pole?! This doubles as boxing and we provide two pairs of boxing gloves. Our high, safety net sidewalls make this the safest inflatable gladiator joust arena. Unit includes 2 padded joust poles, 2 headgear, 1 blower, game bag, and stakes. * Please call us with any questions about our inflatable gladiator combo rentals in Columbia and Jefferson City MO.